Eduard Imhof (1895-1986) was professor of cartography at the Swiss Federal Institute of Technology (ETH) Zurich from 1925 - 1965. 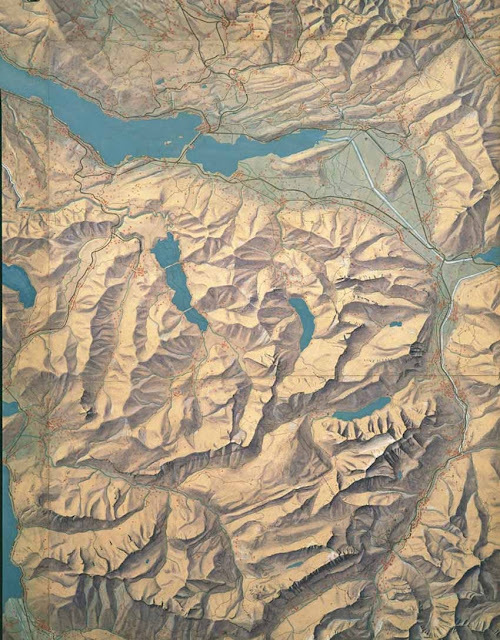 Imhof was a legendary visual designer, artist and map maker. He wrote a classic book on map making - Cartographic Relief Presentation. "Imhof is one of the people responsible for the great Swiss national maps, one of the best information designs ever (see my Envisioning Information, p. 80 for a sample of the Swiss mountain maps). It is one of the most technically sophisticated design books, so much deeper than the standard books on graphic design. The book is required reading for anyone serious about information and interface design. Imhof also published many articles in cartographic journals which are also relevant to information and interface design." HERE is a website of his work, hosted by the ETH library.